Devyn Christensen might just have it all. She is scheduled to get married in early April to Landon Petersen, a finance major expected to graduate after the summer. She will earn a degree from Utah State University in May. She’s also a major college basketball star—one of the best in the nation. Just weeks ago, she became her school’s all-time leading scorer, helping the Aggies in a march toward a possible NCAA Tournament bid. She’s good, in fact, that she may not just play professionally in Europe, but have a crack at the WNBA. The question, however, is if the newlyweds will start their lives together by following her path. Will she really have it all? “We talk about that a lot,” she says. The Caldwell, Idaho native speaks about professional opportunities—how she could play for several years in Europe and even garner a tryout to play in the WNBA, the highest professional level of women’s basketball. Though he’s only known her for 10 months, USU coach Jerry Finkbeiner believes she’s capable of reaching her goal. In his 22 years as a head coach at Oral Roberts and Southern Nazarene, Finkbeiner has sent about 25 players to the professional ranks, including a few to the WNBA. “I know that level of talent, and Devyn does have it,” he says. Though he says Christensen is the most “complete” player he’s coached in his career, Finkbeiner isn’t applying undue pressure—“She can hang her shoes off and feel good about career,” he says. And Christensen has thought about starting a family. A devout Latter-day Saint (her teammates often call her “the Mormon Mamba” because her favorite player Kobe Bryant is the “Black Mamba”), she plans on deciding after study of scripture and prayer. The highest leaders of the Church of Jesus Christ of Latter-day Saints, regarded as prophets, in 1995 released a document titled “The Family: A Proclamation to the World.” In the decree, men are declared to “preside over their families in love and righteousness and are responsible to provide the necessities of life and protection for their families.” “Mothers are primary primarily responsible for the nurture of their children,” it adds. Her appreciation for these gender roles have made for strenuous considerations. That isn’t necessarily stopping either of them as they weigh what LeBron James might call “The Decision.” The proclamation also states that “fathers and mothers are obligated to help one another as equal partners” in their familial responsibilities. “I defintely need to exercise those opportunites and see what I can get,” she says. 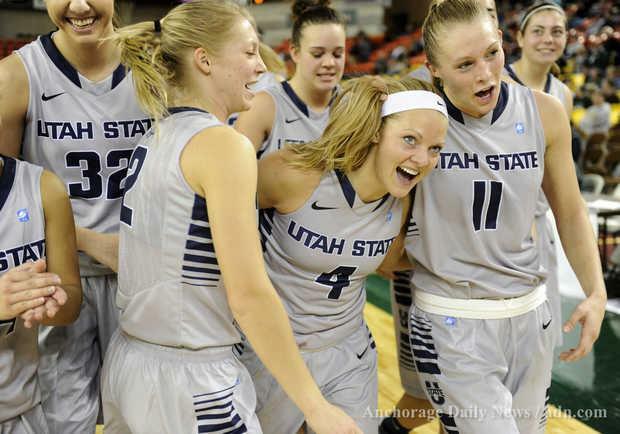 One aspiration she can be sure of: her rank as USU’s scoring queen. She made a 3-pointer from the left corner on Feb. 9 in the first half against San Jose State set the mark. With 3-pointers as her specialty, Christensen made three straight that night in the Spectrum in breaking the record. The moment ranked among her most favorite of her career, breaking Jerrie McGahan’s 1,353 point pillar. Also in the rankings was USU’s WNIT victory over Arizona in March 2011—the program’s first WNIT victory and first postseason win since a 90-74 victory over Northern Colorado in the AIAW Championship in 1977. The greatest, however, came away from the Spectrum and the dozens of arenas she played in during her career. Like her scoring record, meeting Petersen clearly came first. “He’s my passion,” she says of the man who may follow her. Her other desire far before encountering Petersen was to help build a program. With just one winning season in the program’s seven since USU started anew under Raegan Pebley in 2002, Christensen certainly got her wish—and is now realizing it. The Aggies have achieved winning seasons in three of Christensen’s four years, including three straight. They reached the WNIT again last season, and this season dropped the opportunity to tie for the WAC regular-season title on the season’s last day. Because USU has won 12 of their 14 games heading into their WAC Tournament semifinal against Idaho, however, the Aggies are a popular pick to win the playoff and earn an automatic berth to the NCAA Tournament. Much like the Mormon Mamba struggles to slither through the expectations of her own faith and some other immediate opportunities. Next Next post: I knew it.